Late one night, when I was almost four years old, I remember being awake in bed, listening to my father talk downstairs in the living room. “I want to wake him up to see this. He’ll probably never have a chance to see anything like this again.” My mother wanted me to stay in bed. She knew that if I got up, I wouldn’t go back to sleep. The sky was filled with stars. Beautiful bright stars set off against a black autumn night. 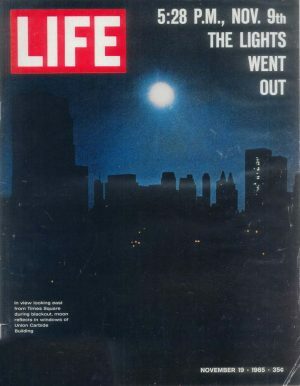 It was November 9, 1965, the night of the Great Blackout. There was no electricity anywhere in New York or most of the New England states. We lived in Waterbury, Connecticut, and on this night, without any lights to spoil the view, my dad and I looked at the stars. We got to see what people through most of history saw at night. A beautiful sky filled with stars. If you looked, you could view the stars arranged in patterns that told wonderful stories from the heavens. Today, we live in a great world with huge cities and instant communication. I think this is the best time in history to be alive, but it’s very different from the way people lived for almost all of history. If you didn’t have my experience, it might be difficult to understand how people could imagine a storybook in the sky. Several years ago, I went on vacation to a small town in northern Vermont, high on a mountain. Even there, the small town of St. Johnsbury, twenty miles away, gave off too much light to see the sky the way I saw it more than 50 years ago. I’ve studied history because I’ve wondered how our civilization developed. This website is a result of what I’ve learned. The story of how we developed from prehistory to our modern world is fascinating. I hope you will join me in these pages on a journey through time and space. Life was one of America’s most popular magazines in 1965. The cover of the following week’s magazine captured the night my dad and I saw the stars. 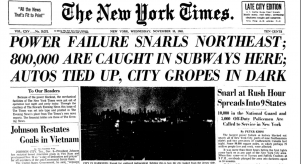 The New York Times headline from the morning after the blackout. 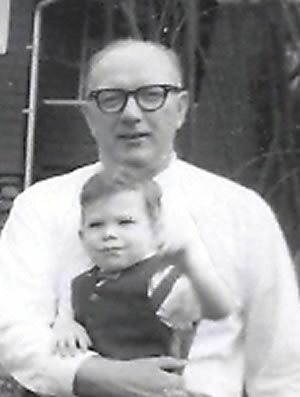 My dad and me a few months before we looked at the stars.